The third in the hilarious yet sizzling hot Hudson Valley series from New York Time and USA TODAY bestselling author Alice Clayton.Clara Morgan is living the dream, if you can call rebranding hotels that are desperate for a new life and running any kind of marathon a dream. Which she does. But the career she loves and the endurance races that keep her adrenaline pumping have kept her too busy to put down any roots. Growing up in foster care, she’s never been able to establish traditions of her own, which may be why she’s fascinated by the rituals that generations-old family resorts are known for. She’s especially interested in the Bryant Mountain House, and not just for their secret recipe for the yummy, gooey, can’t-get-enough-of Hot Cross Buns…. Archie Bryant, the man with the Buns, is fifth generation and one-day-owner of the charming yet run-down Bryant Mountain House in Bailey Falls, New York. He’s determined to save his family’s legacy from the wrecking ball the old-fashioned way—by gritting his teeth and doing what needs to be done. There’s no way Archie will be influenced by the new hotel branding expert his father brought in to turn one hundred and fifty years of tradition on its head just to attract a faster, younger, slicker crowd. But when some of Clara’s ideas start bringing in new, paying customers, Archie can’t deny that she may have just given him a shot at keeping his resort open. It’s sticky, it’s messy, it’s sweet, it’s Buns. 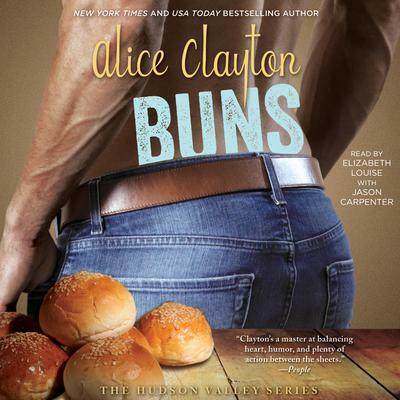 The third in the hilarious yet sizzling hot Hudson Valley series from New York Time and USA TODAY bestselling author Alice Clayton.